Human blood performs many important functions including defence against disease and transport of biomolecules, but perhaps the most important is to carry oxygen – the fundamental biochemical fuel - and other blood gases around the cardiovascular system. Traditional therapies for the impairment of this function, or the rapid replacement of lost blood, have centred around blood transfusions. However scientists are developing chemicals (oxygen therapeutics, or “blood substitutes”) which have the same oxygen-carrying capability as blood and can be used as replacements for blood transfusion or to treat diseases where oxygen transport is impaired. 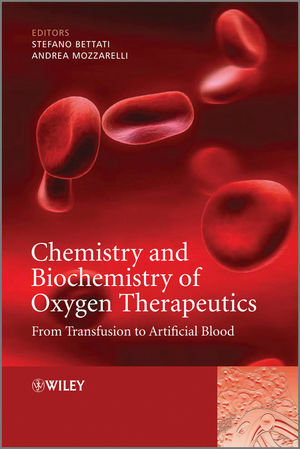 The first part of the book deals with the chemistry, biochemistry, physiology and toxicity of oxygen, including chapters on hemoglobin reactivity and regulation; the major cellular and physiological control mechanisms of blood flow and oxygen delivery; hemoglobin and myoglobin; nitric oxide and oxygen; and the role of reactive oxygen and nitrogen species in ischemia/reperfusion Injury. Finally “old”and new strategies for oxygen supply are described. These include the political, administrative and logistic issues surrounding transfusion; conscientious objection in patient blood management; causes and consequences of red cell incompatibility; biochemistry of red blood cell storage; proteomic investigations on stored red blood cells; red blood cells from stem cells; the universal red blood cell; allosteric effectors of hemoglobin; hemoglobin-based oxygen carriers; oxygen delivery by natural and artificial oxygen carriers; cross-linked and polymerized hemoglobins as potential blood substitutes; design of novel pegylated hemoglobins as oxygen carrying plasma expanders; hb octamers by introduction of surface cysteines; hemoglobin-vesicles as a cellular type hemoglobin-based oxygen carrier; animal models and oxidative biomarkers to evaluate pre-clinical safety of extracellular hemoglobins; and academia – industry collaboration in blood substitute development. Chemistry and Biochemistry of Oxygen Therapeutics: From Transfusion to Artificial Blood is an essential reference for clinicians, haematologists, medicinal chemists, biochemists, molecular biologists, biotechnologists and blood substitute researchers. Andrea Mozzarelli is Full Professor of Biochemistry in the Pharmacy Faculty at the University of Parma, teaching general and applied Biochemistry. He is Member of the International Advisory Board for Vitamin B6, PQQ, Carbonyl Catalysis and Quinoproteins Meetings, and was scientific organizer of the international courses on "From Structural Genomics to Drug Discovery" held at the University of Parma in 2000, 2002 and 2004. Between 2004 and 2006 Professor Mozzarrelli was head of a research unit of a EU funded project on "EuroBlood substitutes". He is President of the XII International Symposium on Blood Substitutes, to be held in Parma, Italy, on August 25-28, 2009 (http://alice.bio.unipr.it/blood2009/). Professor Stefano Bettati, Department of Biochemistry and Molecular Biology, Faculty of Medicine, University of Parma, Italy.